Exam boards are telling schools affected by the Manchester attack that they can decide whether to go ahead with GCSE and A-level exams. A joint statement from the exam boards says schools are "best placed" to make such a decision. The exam boards say no students will be "disadvantaged". "Schools and colleges affected by the bombing should contact the relevant exam boards. Students affected should speak to their teachers.‎"
Hundreds of thousands of teenagers are taking exams this week - and young people are believed to be among the victims of the Manchester attack. The exam boards are not postponing any GCSEs or A-levels, but they are giving schools discretion over whether their pupils take them. Exams scheduled for Tuesday are going ahead - and exam boards say that since they will be in the "public domain" - they will not be able to be re-arranged. But there are "special consideration" provisions, such as would apply if a pupil faced a bereavement or was involved in an accident. These could provide grades based on previous work - but would be determined on a case-by-case basis. History, physics and RE are among the subjects being taken today. "Our thoughts go out to everyone affected by last night's terrible incident in Manchester," says a statement from the Joint Council for Qualifications. "GCSE and A-level examinations ‎are taking place today across the UK but, understandably, some students, schools and colleges will have been affected by the bombing. "School leaders are best placed to decide if exams should go ahead and, if they decide they are not, exam boards will make sure that no student is disadvantaged. 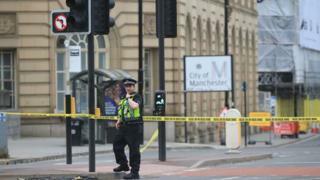 The Joint Council for Qualifications says awarding bodies will look at individual cases following the attack to ensure that there is "fairness across the system". "There will be some flexibility on start times given the transport difficulties in Manchester." But there will also be questions about the security of an exam if it is rescheduled. "The most important thing is that centres contact their awarding bodies and students contact their teachers for guidance," says the JCQ.